Spira’s latest Spring Loaded Walking shoes, the WaveWalker & WaveWalker DX3, are redesigned to fit better than the previous Spira Walking Shoes. The WaveWalker is available for both men & women and comes in two colors, black & white. There are also two models: The WaveWalker has one spring located in the heel while the WaveWalker DX3 has three springs, one in the heel and two in the forefoot for additional cushioning and energy return. 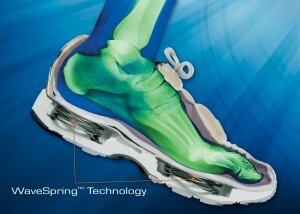 Spira puts a real spring in your step with its patented WaveSpring® Technology. The cushioning system offers energy return while providing a reduction in stress and fatigue. Whether you run, walk or must stand on your feet all day, Spira offers the ultimate in cushioning and comfort. An all-purpose walking shoe designed for those who prefer comfort with maximum cushioning benefits and to aid in the reduction of fatigue and overuse related to walking issues. Encapsulated WaveSpring® Technology (EWT™) is a new patent pending design process which encases the WaveSpring® within a polyurethane midsole. This technique provides maximum cushioning benefits for the ultimate in cushioning and comfort. Tri-spring model is the WaveWalker DX3. The 5mm molded EVA foot-bed/insole can be removed to accommodate orthotics. Midsole: The soft expanded PU midsole gives superior cushion and resilience while cradling the foot for comfort. Outsole: Dual density polyurethane (PU) sole encapsulating the patented WaveSpring® technology. Removable foot-bed for using custom orthotics. An important adviser to the design of the Spira’s latest shoes comes from New Balance. Jim Tompkins, the former President and Chief Operating Officer of New Balance Athletic Shoe Inc., was named President of the patented WaveSpring-inspired Spira brand in August 2010, before the announcement he served in an advisory role to direct the development and expansion of the product line at Spira. He served the past nine years as President and Chief Operating Officer at New Balance until stepping down in June 2009. When Tompkins took the helm in December of 1999, New Balance employed more than 2,000 people and reported worldwide sales in 1998 of $630 million. Under Tompkins’ leadership, New Balance doubled its global workforce and reported worldwide sales in 2008 of $1.63 billion. Spira Footwear and their customers will and already has greatly benefited from Tompkin’s experience. Click to see the WaveWalker DX3 (tri-spring model) and all of the other Spira Shoes with Springs or click the pictures below. Dr. Andrew Weil, America’s Top Wellness Doctor, has a new line of Integrative Footwear that advances his mission of Integrative Wellness. The shoes and sandals in Dr. Weil’s footwear collection are highly relevant to the lifestyle that he advocates, one aspect of that lifestyle is Walking. 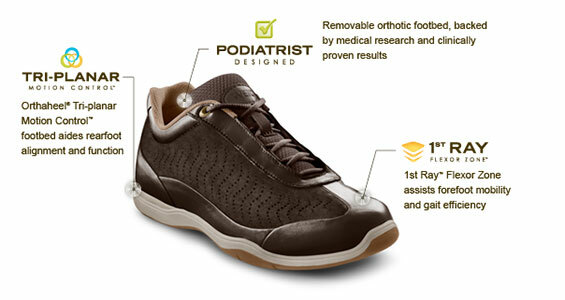 Dr. Weil’s Balance Walker is a shoe with unique technology Orthaheel Technology found in the podiatrist designed Orthaheel footwear products. The Orthaheel technology is the best way to protect feet from the shock of walking on hard surfaces, and it keeps the foot and ankle properly aligned and supported, and mimics the effect of walking barefoot on natural surfaces. Complementary orthotic treatment – use custom orthotics with shoes / slippers, sandals have built-in arch support / pronation control.